Dogon tribe-members reportedly burned a large portion of a Muslim Fulani village. Tensions among ethnic communities have surged since the government started battling extremists in its desert territories. Members of the Dogon tribe staged an attack on the Peulh village of Ogossagou in central Mali on Saturday, local officials confirmed. The Peuhl community is part of the Muslim nomadic Fulani group. The massacre took place as a delegation from the UN Security Council was visiting the Sahel to evaluate the jihadist threat that has crippled the region. Dogon and Peulh communities have long co-existed in central Mali, but the emergence of jihadi violence has upended the peace. Since then, repeated clashes between the Fulani herders and the Dogon ethnic group have occurred. Dogon hunters are said to have descended on the village, near the border with Burkina Faso, early on Saturday. Two witnesses told AFP that the Dogon burned down nearly all the huts in the village. Victims were shot or hacked to death with machetes, a security source said. 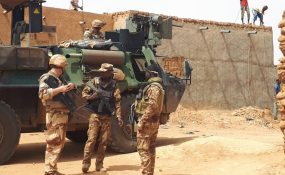 Malian troops, along with local support, arrived at the site of the massacre later in the afternoon and said the death toll reached at least 105. "The new toll is 115 dead, "mayor of neighbouring Ouenkoro Cheick Harouna Sankare said. Moulaye Guindo, mayor of the nearby town of Bankass, said it was the deadliest attack in recent times. He reported that the nearby Fulani village of Welingara had also been attacked, causing "a number" of deaths, but could not provide an exact figure. Members of the Dogon group have accused the Peulhs of supporting jihadists linked to terror groups in the country's north and beyond. But the Peulhs have in turn accused the Dogon of supporting the Malian army's efforts to stamp out extremism. Jihadist groups linked to al Qaeda and Islamic State have been exploiting ethnic rivalries in Mali and its neighbors Burkina Faso and Niger in recent years, with the goal of boosting recruitment and fostering lawlessness. Once considered a beacon of democracy and stability in Africa, Mali has been crippled by a coup, civil war and Islamist terrorism, since extremists took control of the desert north in early 2012. Despite jihadists being driven out by a French-led military operation in January 2013, current efforts by UN peacekeepers and the creation of a five-nation military force, extremist violence in the region continues unabated.